An interesting article that ends on a weird note about the mysterious Xiongnu people. Some Hongkongers are unhappy that a facility in the West Kowloon Cultural District will be named the Xiqu Centre, arguing that "Chinese Opera Centre" would be more appropriate. However, calling traditional Chinese theatre "Chinese opera" is like calling spaghetti bolognese "Italian zhajiang mian": it's inaccurate and implies it is a lesser or ersatz version of the genuine article - European opera, or Chinese noodles with meat sauce. If Japanese kabuki theatre remains as is when referred to in English, I fail to see what's wrong with xiqu. It amuses me to see Chinese Hongkongers who give themselves foreign names such as Johnny or Yumiko go ballistic when a pinyin name appears on a building. It's obvious what's going on here. Some try to explain their pinyin-phobia by arguing that it is "difficult" for non-Putonghua speakers to pronounce. But while consonants such as x, q and c do twist many a tongue, pronouncing pinyin is no more difficult than pronouncing Irish or Czech. Non-speakers will never replicate the actual sounds of words via transliterations but in the case of the ancient Xiongnu people, Chinese transliterations give us a clue as to who they were. Active from 200BC-AD400, the mysterious Xiongnu founded kingdoms in China and empires across Central Asia but left no written records. Linguistic analysis, however, offers tantalising hints as to who they might have been. 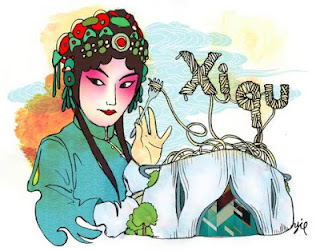 The word " Xiongnu" would've been pronounced "hiung-no" in archaic Chinese, leading to speculation that they might have been the forebears of the Huns. Why does it appear to always be the woman who bends over backwards for the male muslim? Cecile, over at China Droll, knows the answer! The most high-profile example is cricket great Imran Khan and his wife Jemima, who converted to Islam. Let's see whether Rainbow Ng will do the same. The SCMP has been running their weekly Wedding Snippet for quite some time now, which always spews on about hopes, dreams and happily-ever afters. Considering the divorce statistics (from The Economist), it would be complementary for the media to run a Couples Spilt Snippet, which can offer their experiences of their marriage so that real and useful advice can be imparted. By all means "float on air" and sing "Somewhere Over The Rainbow" (here's Izzy's version) but in the long term there needs to be a reality check. Rainbow Ng is a Hongkonger born and bred, while Mohammed Naveed Khan is of Pakistani descent. Although they are from different cultural backgrounds, their willingness to compromise has led to a lasting relationship. Rainbow, a personal assistant, and Naveed, who works for an airline, wed last month in a Pakistani ceremony at Duetto, an Indian-Italian restaurant in Wan Chai, celebrating with 250 friends and relatives. They will host a Chinese banquet in July. The couple were introduced by a colleague three years ago when they were working for the same airline. "He seemed really nice, but I was a little nervous when I first met him because he was quite senior at work," Rainbow said. It took three months before they realised there was more than friendship between them. "I was on holiday overseas with my family and my mother fell ill. Naveed was really helpful, sending me advice by text message," Rainbow said. "We really missed each other." When she got home they went on their first dinner date. "It was a very romantic and memorable date that showed me another side of him - his gentleness and great sense of humour," Rainbow said. "He's a big guy and he's also got a big heart." They started dating regularly and Rainbow decided she was ready to take a big step that would please Naveed. "Naveed is a Muslim so he doesn't eat pork. I decided to give up pork out of respect for him," she said. It was only later that Rainbow realised how big a commitment she had made. "It was hard to give up my mum's soups," she joked. Naveed was moved by Rainbow's devotion, as were their friends and relatives, who offered her support. "When I was prepared to honour his beliefs, I realised I had found the man I wanted to spend the rest of my life with," she said. Last May, the couple went to Paris for a holiday. "I thought that maybe he'd propose during that trip, but he scolded me jokingly, saying he'd never do it in Paris," she said. That turned out to be a well-intentioned lie. When they arrived at the Eiffel Tower, Naveed made an excuse to leave and left Rainbow waiting alone in the plaza. A stranger walked up to her and gave her a rose. A few seconds later, another stranger handed her one, and the roses kept coming. Next, Naveed returned, got down on one knee and pulled out a ring. Amid a crowd of tourists, he asked Rainbow to marry him, and the teary Rainbow said yes. Rainbow said she loved Naveed's charisma, kindness and, more importantly, his family values. "He really loves his parents and relatives, and mine as well. I think that's essential in a relationship," she said. "Naveed speaks fluent Cantonese so he can communicate with my family easily. My heart melts every time he and my mum crack a joke." Snakes Alive! What does it take to become a Fung Shui master? An ability to fiddle with sticks and stones and words? Why does the Heung Yee Kuk chairman always have to pick the stick? What special quality does he, er, possess? Why not ask self-styled Fung Shui master Tony Chan? He'll probably charge an arm and a leg, but then again he is in need of some dough. Hongkongers were warned they faced "wicked people" and obstacles in the Year of the Snake, after one of the unluckiest possible omens was drawn in a Taoist ceremony yesterday. A stick bearing the number 95 was drawn by Heung Yee Kuk chairman Lau Wong-fat at Sha Tin's Che Kung Temple in the annual ritual. The prediction for stick 95 says: "In a splendid carriage you embarked on your journey. Today, you came home barefoot. Is it that you failed the imperial exam? Or did you lose all your gold in business?" It reminds Hongkongers to "beware of wicked people", and says "nothing is going well". 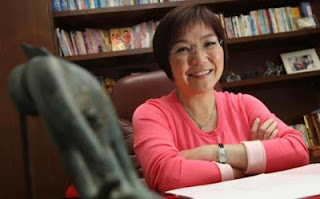 Mak Ling-ling, one of the most famous fung shui masters in the city, said the stick could be saying the policies put forward by the government could fail although they sounded glamorous in the beginning. "It could mean the government's strategy was not right. It might be confident, but there are obstacles," she said. She did not think "wicked people" was a specific reference. This is the third bad-luck stick to be selected in a decade; following one in 2003, when Hong Kong was hit by the severe acute respiratory syndrome outbreak, and another in 2009, when it was hit by the global financial turmoil. Chu Ling-ling, a fortune-teller at the temple, said the stick meant uncertainties would trouble the economy. The horse carriage in the verse was a reference to Chief Executive Leung Chun-ying, who was born in the Year of the Horse, she said. There would be political turmoil, and although Leung would not fare too badly in the first half of the year, he could face trouble towards its end. "Leung needs to change his way of doing things. He should refrain from being too tough, and he needs to rebuild his credibility, so people will trust him again," she said. Lau tried to put a positive spin on it, saying: "Hong Kong will continue to be prosperous and stable ... An unlucky stick could be good, too." Meanwhile, Hong Kong's first Year of the Snake baby, a girl, arrived at Union Hospital in Sha Tin at 0.17am on Sunday. Chill out Hongkongers, the economy in the Year of the Snake will be better than it was last year. That is the verdict of fung shui masters as the city bids farewell to the dragon and greets the snake tomorrow morning. The fung shui masters differ in their forecasts of what lies ahead for Chief Executive Leung Chun-ying and the government. "The economy will be better than last year, although it will still not be very bustling," master Mak Ling-ling said. "But for C.Y., his Chinese zodiac sign is the horse, and that is not a good thing in the Year of the Snake. In Chinese we have a saying that the snake winds around the legs of the horse when the horse tries to move." Master Ma Lai-wah forecast the economy would continue to grow but cautioned that people would not have more money in their pockets until August. The key is to invest in exports and avoid speculation in property, as prices will rise and fall about 10 per cent several times, he predicted. "And be ready for more disharmony between Hongkongers and mainlanders, because the cultural differences will get deeper." Ma said Leung had the characteristics of an eagle, which do not get along well with snakes. 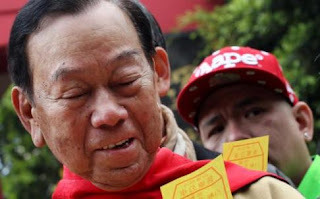 But Raymond Lo, popularly known as "Fung Shui Lo", predicted an easier year ahead for Leung. "The Year of the Snake is symbolised this year by water sitting on top of fire," Lo said. "The animal sign for horse does not directly clash with the snake. So it will be a comparatively more stable year for Mr Leung. "For people born in the Year of the Horse, a snake year brings the flower of romance, so they can expect a more sociable year. In short, Mr Leung will still face challenges but he will remain OK."
As for Hong Kong's economy, Lo said the fire symbol attached to a year often generated optimism, and the economy should turn more stable compared with the dragon year. "Banking is [associated with the element of] metal and it needs fire to melt it into useful tools. And finance and stock market are more related to fire," he said. "We may expect improvements in the economy." 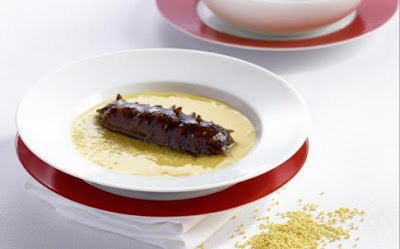 Sea cucumbers have a certain smell but no distinct taste. It must be mainly the texture that Chinese palates like about these marine creatures.